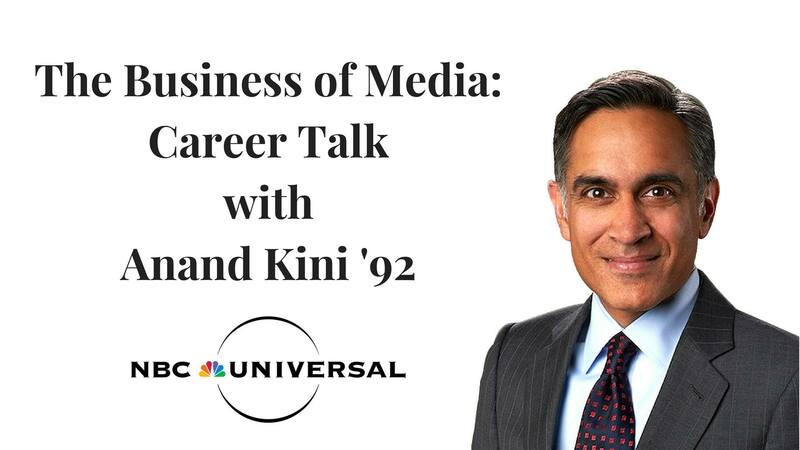 Join us for a career talk with Anand Kini ’92, CFO of NBCUniversal. Anand Kini was named Chief Financial Officer for NBCUniversal in May 2015. In addition to his role as CFO, Kini will continue to help shape NBCUniversal’s long-term strategic direction, and lead consumer and business insights efforts. He is a member of the Executive Committee and reports to Steve Burke, CEO, NBCUniversal. Kini will discuss his career path and share how he broke into the media industry. Most recently, Kini served as Executive Vice President, Strategy and Business Insights where he oversaw the company’s long-range strategic planning. Additionally, he managed the existing research infrastructure and worked to create new capabilities to best support the businesses’ needs, which included evaluating entertainment consumption, advertising monetization and the emergence of new viewership platforms to better inform NBCUniversal decision making. Prior to joining NBCUniversal in July 2011, Kini was Senior Vice President, Financial Planning, and Analysis for Comcast Cable Communications, LLC. In that role, he managed Comcast Cable’s forecasting, annual budget, and three-year planning process, and served as a key analytical resource to help the cable businesses identify emerging market trends, evaluate competitive positioning and determine attractive growth strategies to drive strong financial returns. As an undergraduate at Wesleyan, Kini majored in economics and he went on to earn his MBA from Harvard Business School. Posted by wilk in Events on October 3, 2017 at 8:47 PM.